While there’s no substitute for following a healthy diet with an abundance of fruits and vegetables, supplements can help bridge the gap and provide you with essential vitamins and minerals that you may be lacking. But how do you know which supplements you should be taking to help your body function at it’s best? If you’ve taken a walk down the supplement aisle of your local grocery or health food store, you’ll know what I’m talking about. It’s overwhelming! Bottle after bottle of vitamins, minerals, “miracle pills,” etc. If you’ve been tested by your healthcare provider and found to be lacking in particular vitamins or minerals, then obviously, follow their advice on the steps you should be taking. Having said that, I’ve done some research and discovered 5 of the best supplements that’ll help you bridge the gap and provide your body the essentials that it needs to be functioning at optimal levels. Omega-3 fatty acids are essential fatty acids – this means that our body cannot produce them itself, so we need to get them from outside sources. According to the Harvard T.H. Chan School of Public Health, omega-3 fatty acids may also help to control lupus, eczema, and rheumatoid arthritis. But despite omega-3 fatty acids being an integral part of a health body, according to this study by Nutrition Journal, many adults are deficient in omega-3, and supplementation is recommended. I highly recommend these Omega-3 supplements from Viva Naturals. Unlike other omega-3 supplements, Viva Natural’s omega-3 supplements have no fishy aftertaste and are never made from farm-raised fish, only sustainable, wild caught fish. According to the Vitamin D council, vitamin D is needed to to help absorb calcium. Calcium helps to prevent osteoporosis, a condition in which the bones become brittle. Additionally, your body can actually make vitamin D from the sun, which it then stores for later. However, most people don’t get enough sun (and in winter, it may be impossible to get any sun at all.) And due to the risks of skin cancer from excessive sun exposure, most people use sunblock and/or wear protective clothing, further reducing the amount of vitamin D production. This is why it’s important to take a vitamin D supplement, particularly in the winter months. In addition to helping prevent osteoporosis, WebMD states that there are numerous other health benefits of vitamin d, including possibly reducing the risk of certain cancers and diabetes, and lowering the chance of a heart attack. I take this NatureWise Vitamin D3 supplement daily. It’s made with certified organic olive oil and provides the same form of vitamin D as sun exposure, without the risks of skin cancer. Hippocrates, the father of modern medicine said that “all disease begins in the gut.” While we now know that all disease does not begin in the gut, it’s believed that many diseases do have their origins in the gut. 70% of our immune system is located in our gut, so maintaining a healthy gut is incredibly important. There are about 100 trillion bacteria that line our gut, and they’re all working together to to help protect our body from harmful invaders. Eating probiotic-rich foods like kefir and kimchi is an excellent way to increase the healthy bacteria in your gut. Additionally, you can take a probiotic supplement to boost your healthy gut bacteria. This Deep Immune Optimum Probiotic requires no refrigeration (so great for traveling) and unlike many other probiotic supplements, it not only supports the good bacteria, it also helps to crowd out the bad. While no supplement can replace a healthy diet, most of us just don’t get the recommended intake of fruits and vegetables every single day. Health experts recommend that we eat at least 5-9 servings per day of fruits and vegetables, however, studies have shown that for optimal health we really should be eating 10 servings or more. I’m going to be honest here and say that even though I eat a very healthy diet, full of fruits, vegetables, and lean protein, I definitely do not eat 10 servings of fruit and vegetables every single day. I’m positive that I’m not alone in this! I was recommend a wholefood nutrition supplement by Dr. William Sears, during my health coach training. Dr. Sears is a renowned medical doctor who takes this supplement daily. Another health professional who I highly respect, Dr. Mitra Ray, a Stanford educated biochemist confirmed the multitude of health benefits of the supplement. I love knowing that I’m getting the nutrients of 30 different fruits and vegetables every single day, in addition to the fruits and vegetables I consume daily. I consider it my “back-up plan” for those days that my 10 servings just doesn’t pan out! 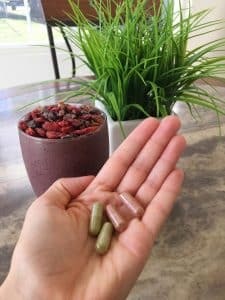 This is the wholefood nutrition supplement myself and my husband take daily, and I can certainly attest to the little energy boost it provides, alongside the massive nutrient boost. If you’d like more information on this premium wholefood supplement, please feel free to contact me. Antioxidants work to protect your body from the free-radicals we’re constantly exposed to. Left to their own devices, free radicals cause cell damage and contribute to wide variety of diseases, including cancer. In fact, Mercola states that free radicals are linked to over 60 different diseases, so they’re definitely something you want to be fighting against. Antioxidants can be found in the food we eat, with WebMD listing red, pinto and kidney beans, artichokes, and various berries including blueberries, cranberries, blackberries, raspberries and strawberries as excellent sources of antioxidants. However, most of us don’t eat a perfectly balanced diet all the time which is why you should consider taking an antioxidant supplement, like this Amazing Grass Green Superfood Antioxidant. *Note – if you’re pregnant or thinking of becoming pregnant, it’s a good idea to take folate to help prevent neural tube defects. It’s important to remember that no amount of supplementation can fix an unhealthy diet. The majority of your vitamins and minerals should be coming from the foods you eat. However, it’s unrealistic to think that everyone is going to eat a “perfectly balanced diet” all of the time, which is why it’s important to choose high-quality supplements to ensure optimal health and wellness.